Nathan Charles turned eight last week. I can't believe he did that to me. I am certain we had a conversation about it once, and I tried to make him promise to stay little. But it's not working. He keeps growing. He holds the distinct honour of sharing a birthday with my Mom, and a name with my Dad. I'm pretty much the favourite because of it. Or at least I'm still trying. Actually - he also shares a birthday with my sister-in-law's Mom in Botswana too - it's just a good day to be born! Birthdays are also a good excuse to eat lots of food. I took a cue from Dairy Queen and made an ice cream cake for when we had my family over...I might have to make it a few more times this summer to perfect it! 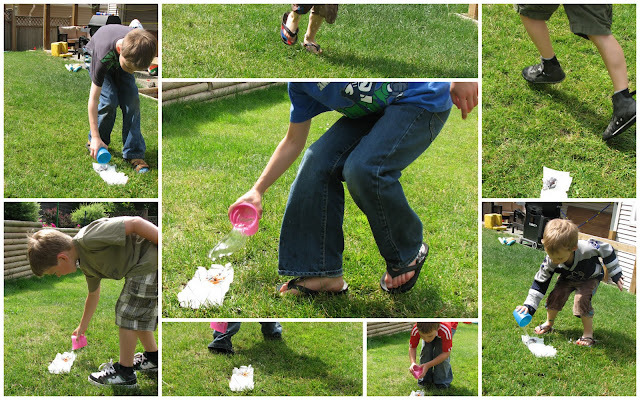 It's funny the memories that flood back when I think of the days each of my kids were born. I remember Mark & Lisa coming to stay with our kids and having more fun with Morgan and Brennan the day that followed than our kids had ever had in their life before. I remember being in complete denial that I was in labour, because I was two weeks early, and had told the doctor just the day before that I thought we should have booked the c-section date earlier than we had - but who is ever right about that??? I remember it was the first time my Dad was on the other side of the country when one of his grandkids was born. I remember, when we finally did go to the hospital and it was confirmed that I was, in fact, in labour, choosing to not wake up an anesthetist in the middle of the night and opting instead for morphine and waiting out contractions till the morning, in the hopes that I would finally get a "good block" unlike the first two deliveries. I remember figuring out that when I did get an epidural that actually worked, that epi-morph makes me borderline insane. I'm still using that as an excuse. Then we had a fantastic friends party at our house. It was awesome. We picked a theme and we ran with it. Nate loves a theme almost as much as I do! The theme this year: Star Wars. I think Brennan's 8th birthday party was also with the same theme. That's one of the advantages of having so many boys - by the time Keaton gets to requesting a Star Wars birthday party, I'll be able to do it in my sleep! 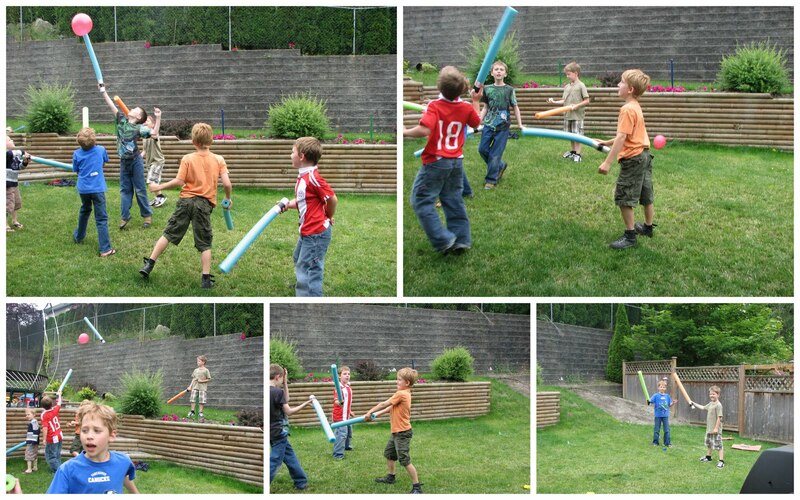 We played a few games... most of them involving pool noodles that we turned into "light sabres". My favorite part about those pool-noodle sabres is that they could whack each other like crazy, and no-one got hurt ! So far no-one has noticed that I tend to choose the same games over and over again and just "theme them up" by changing the names...I'm a tricksy Mom that way. We shot silly string at targets, played Freeze Fighting, melted Star Wars figures encased in Carbonite, did a Jedi Training Course, it was all kinds of awesome for these boys. I might have enjoyed it as well. Keaton may have slept through the whole thing. The boys gulped down Yoda Soda (you may have heard it called Mean-Green-Sedin Soda in the past), they ate a shocking number of Fruit Sabres,- I guess it's all in the name, and the boys demolished the Death Star cake like the Rebellion depended on it. 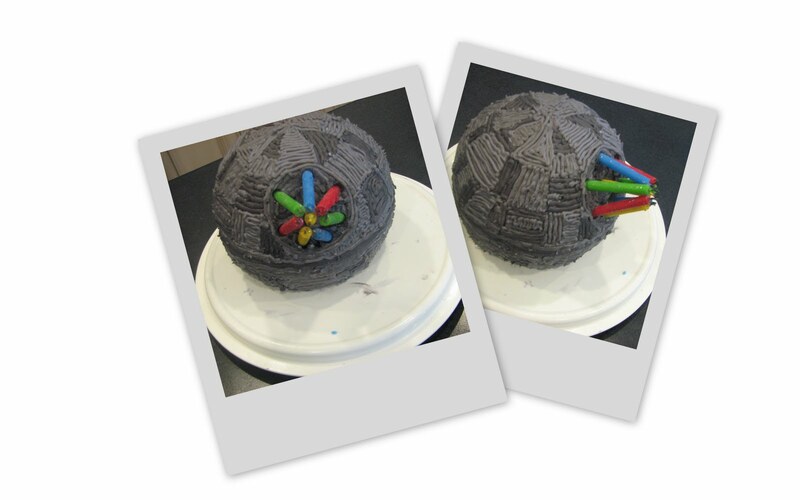 By the way, it was waaay easier making the Sports-Ball Pan into a Death Star than those crazy cake-pucks! When it was all over we sent them home with some caramel-chocolate dipped Pretzels that looked an awful lot like light sabres for a goody bag. They tasted a lot like a Twix bar - I was sorry there weren't a whole bunch extra...or maybe I'm not! Nathan, you are intense. You have been gifted with passion and persistence. I really do love it, and even though it drives me crazy sometimes, I wouldn't ever want you to give up that tenacity, cause I believe it will take you places. You are hilarious. I especially love your pretend cry "Why do you have to be so mean" and your sinister bad-guy laugh. They always make me smile, even when they shouldn't. Remember - timing is everything. I rarely worry about you being our "middle child". You weren't just made for the middle - you own it. May you learn to love and trust that God has some great big plans for your life, Bud. We love you like crazy. And may the force be with you...always. OK so I just read this blog after the picture one and it totally confirms my opinion that you need to put this stuff into a memory book later for your kids - I love it Karina, God has gifted you with words and even when they appear to be slow in coming, I believe He will be faithful to help you keep it coming - your children are blessed to have you be able to express your love for them in such a way that when your words go to be with Jesus they will have them still to hold onto and cherish.